Send your heart rate data per bluetooth to your Smartphone with the Polar Wearlink H7 Bluetooth heart rate sensor with chest strap. Display and analyse your heart rate with a training app. 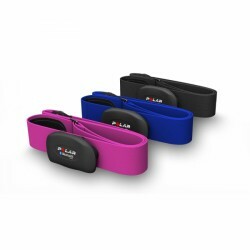 Get your stamina training optimally adapted with the Polar Wearlink H7 Bluetooth heart rate sensor with chest strap. Innovative heart rate strap - i.a. with integrated motion sensor and memory function! 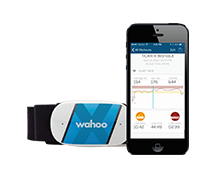 The Wahoo Fitness TICKR X is the first heart rate strap with integrated memory chip - worldwide. Besides all options of the TICKR RUN , the Wahoo Fitness TICKR X heart rate strap BT/ANT+ offers the additional possibility to record data like heart rate, calory consumption as well as training duration - independent of carrying along a Smartphone. Heart rate sensor for ECG precise heart rate measuring, data recording and transmission by using respective Apps for diverse Smartphones! Integrated memory chip for data recording of up to 16 hours training! Ideal for all types of sport, where carrying along a Smartphone is not possible or unwanted (i.e., swimming, playing sport types, etc.)! Integrated tip remote mode works as "ENTER" button to set beginning and end of an activity or training lap. 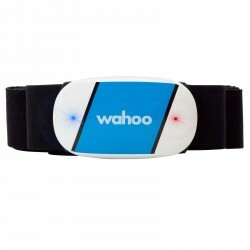 The Wahoo Fitness RPM II sensor offers a very precise measuring of cadence. 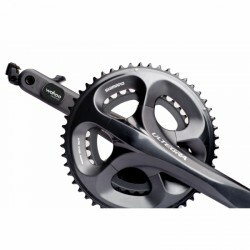 It can be easily mounted on the crank arm and transmits data wireless to compatible iPhones, Smartphones as well as POLAR pulse watches/bike computers with Bluetooth Smart. Your Apple devices become mobile training pcs with the adidas miCoach heart rate sensor for iPhone/iPod touch. The chest strap with heart rate sensor transmits your pulse via the adidas miCoach CONNECT adapter to the iPod touch or the iPhone. Using a fitness-App, you can analyse your training data. In combination with the adidas motion sensor miCoach SPEED_CELL, it is ideal for training of team sports like football. 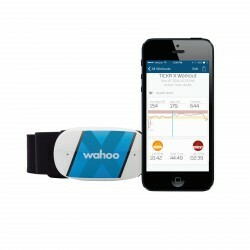 The wahoo Fitness Running set for the iPhone makes it possible to display heart rate and other training data on the iPhone. The small receiving plug receives data of sensors, i.e. of a chest strap, and transmits them directly to the iPhone. Apps of Fisica or NC-17 (available via iTunes in the App-Store) analyse the data. This is how iPad and iPhone get compelte training computers and you get music, telephone, pulse monitor, and fitness program in one set ! Transform your iPhone into a training computer for your bike with the Wahoo iPhone® holder set ANT+ with speed sensor. The iPhone® fixture contains already a receiver technology to transmit your training data to the iPhone®. Speed, cadence, watt or pulse, i.e., can be displayed with the Wahoo iPhone® holder set ANT+ with speed sensor and the appropriate app. You can download those apps in the app-store, i.e. the Cycle NC-17 or apps of Fisica. 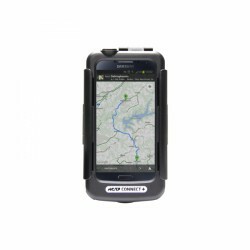 Thanks to the GPS support, you can even trace covered distances with the Wahoo iPhone® holder set ANT+ with speed sensor. Supports iOS 5.1 and later system software; therefore compatible with iPhone® 3G, 3Gs and iPhone® 4 and 4S (nicht iPhone 5). 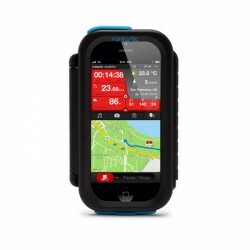 The Wahoo bike fixture for iPhone® is ideal for bike training even under extreme conditions. 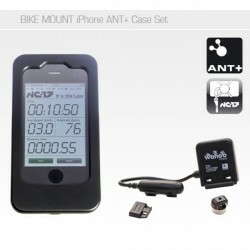 Your iPhone® becomes a bike computer thanks to the APP Cyle NC-17 which measures speed, covered distance, time, and height by means of GPS data. The Wahoo bike fixture for iPhone® allows also camera tour thanks to tool-free calibration and free adjustment. 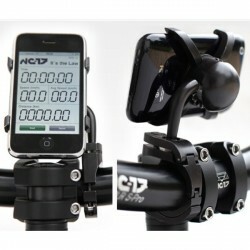 The new bike holder of NC-17 protects the Smartphone while doing outdoor training. The full functionality of the Smartphone is kept. The mobile holder can be mounted on every bike handlebar. Transform an Android Smartphone into a bike computer - it's quite easy with the bezeiochnung ! The protective cover with holder for bike handlebar can take Smartphones of different sizes and offers protection while cycling in the open. Great product, but it's the web site that are so good; ease of use and amazing delivery. Connects with almost every app a tried, i bought it for the concept2 rowing machine but soon used it on every sport. The ant and bluetooth connectivity option is a great advantage. Very good customer service. I will be back for more stuff. In the meantime, there are also alternatives to the pulse watch for analysing the training: the training with the Smartphone becomes more and more popular. Fitness Apps run on the Smartphone - for analysing the training. Though, the Smartphone cannot measure the values - here, we offer you the ideal accessory to transforming your Smartphone into a training computer. It includes, i.e., chest straps, which measure ECG-precisely the heart rate and transmit it to the Smartphone via Bluetooth. For those, who want to use the Smartphone with their bike while exercising. Turn your mobile phone into a real bike computer.